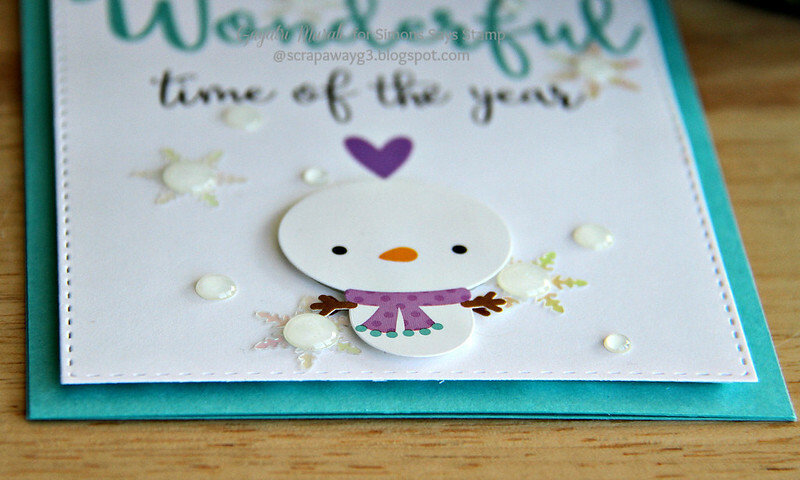 I am sharing with you my first card using Simon Says Stamp January Card Kit! This kit is pretty with the blues, purples and grey hues. Love this kit. And as always, Simon Says Stamp card kits are so easy to work with. After I opened my box and went through the goodies in them, popped the lollipop in my mouth, I made the most simplest card I have ever done. I made the card base using the Audrey Blue cardstock from the kit. Then die cut this pattern paper from Polar Pals double sided 6×6 pattern paper from Doodlebug using the largest Stitched Rectangle die from Simon Says Stamp Stitched Rectangle Dies set. This stitched rectangle die is my staple to use on most of my cards. The stitched detail instantly adds sophistication to the diecut. 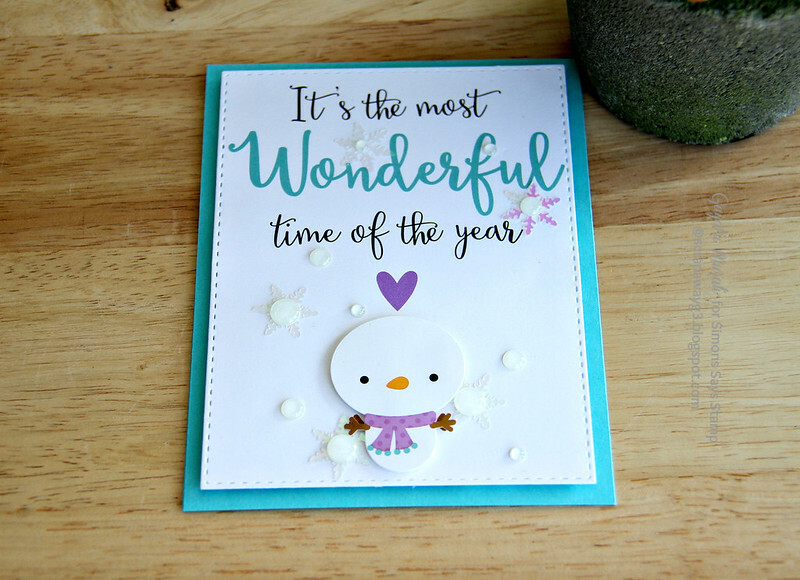 This pattern paper has the big bold sentiment printed with the cute snowman. So there is nothing much to do to the card. I adhered this die cut to the card base with foam for dimension. The kit also comes with the sticker from Polar Pals collection. So I added the snowman sticker over the printed snowman on the pattern paper using foam adhesives. Then embellished with the snowflakes sequins and doodlebug sprinkles enamel dots also from the kit. That’s it! How simple is it to make a card from the kit? This is my first card suing the kit. Will keep sharing more projects during this month. You can find more inspiration using this kit in the gallery! If you like the kit, you can purchase from Simon Says Stamp store. Subscription to the card kits card be done here! I absolutely love this kit!! ADORABLE! Gagarin, You recently mentioned that you cleaned out your craft room, and will be offering some items for sale. Where can I see those items? Thank you so much. Beautiful card Gayatri!! So adorable! I am editing the photos. Just taking a bit longer than expected. Will put them on sale this week. I am glad you want to see them, Linda!